One of the highlights from the GP of Indy weekend was Saturday, the day of the race. Amy Woedl, better known as @OpenWheelMom, set up an Indy Fans Tweetup directly behind the Pagoda. It was the first time I had met Amy in person and let’s just say she’s enthusiastic and energetic. Also, keep in mind that the classic car show was taking place in the Pagoda Plaza so there were a lot of people in the area. There were a few twitter friends that I had to meet in person so I made it a priority to go. If I had to guess, I would say that close to 100 IndyCar tweeps showed up for the gathering to meet some of their fellow followers from twitter. I had seen DJ Jordan (@djordan3223) at the track on Friday so I was not surprised to see him there. I actually met DJ last year at Mid-Ohio with his family. I tried to take his picture on Friday and quickly found out that he does not like it taken, except in large groups. He is in the group picture on the right and you get bonus points if you can pick him out. Think of it as playing “Where’s Waldo?” It was great to see a good turnout with everything going on at the track in the morning. 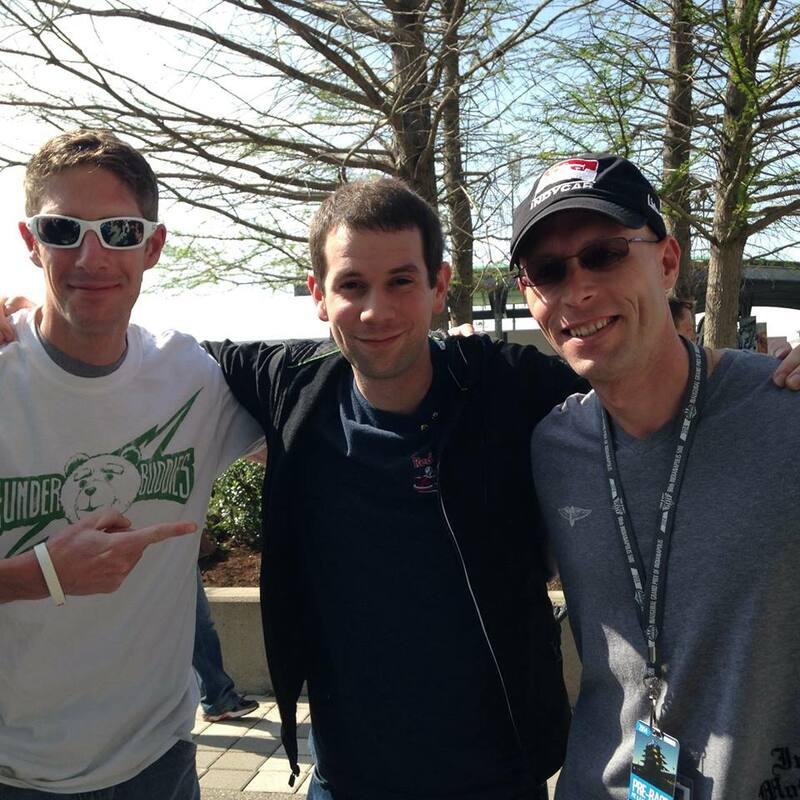 I was also surprised to meet two fans I have talked to many times on twitter, James Alban, @TheKingOfSwing, and Mathew Gruenholz, @IndyCarSTIG. Of course James had his trademark sunglasses on but I would never have guessed what Mathew looked like because his avatar pictures show him with a racing helmet on. I enjoyed meeting them and talking with them for a bit. To me, it’s always great connecting with fans, listening to their stories and passion for IndyCar. I had to memorialize our meeting with this picture. The star of the Indy Fans Tweetup was none other than Pippa Mann. She was not racing in the GP of Indy but she was at the track. Her Indy 500 car was back in the Dale Coyne Garage being worked on so that she could start taking laps in it and shake it down for the first day of Indy 500 practice. 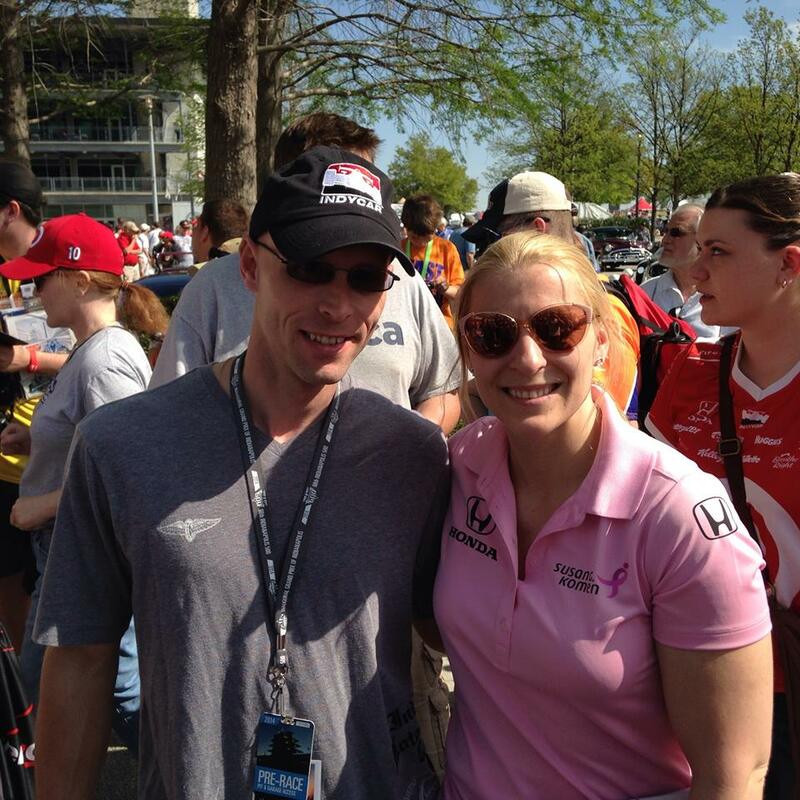 One thing that has always impressed me with Pippa Mann is how fan friendly she is. She took time out of her day to be at this event, with hero cards in hand, to spend time with those who admire her. I remember at last year’s Indy 500 qualifying weekend that Pippa and Conor Daly were the only two drivers standing outside of their garages to sign autographs, have pictures taken and mingle with fans. Every time I walked by they were eagerly awaiting the next fan to come over and say hi. I had never officially met Pippa in person. I had seen her many times, even had her autograph a hero card a couple years ago, but I had never introduced myself. We have exchanged conversations on twitter many times so this time I wanted to let her know who I was. I told her I just wanted a picture and then introduced myself. Before I could get another word out, she said it’s such an honor to meet you as we’ve talked so many times on twitter. I proceeded to tell her that it was my pleasure to meet her and that I appreciate her love of the fans and the sport. She proceeded to interact with the fans until everyone had an autographed hero card, picture or both. Is there any wonder that a cancer organization like Suan G. Komen would sponsor a wonderfully, talented woman like Pippa? Pippa impacts each person she connects with the old-fashioned way, face to face. Pippa is a hard worker both on and off the track. She doesn’t need fancy commercials to sell her sponsor. She sells the sponsor in a way that no advertiser can by connecting with you in person. As a side note, Pippa should be the main speaker for IndyCar drivers on how to use social media. What do you say IndyCar? At a minimum, she needs to to be the key note speaker for the Mazda Road to Indy drivers. 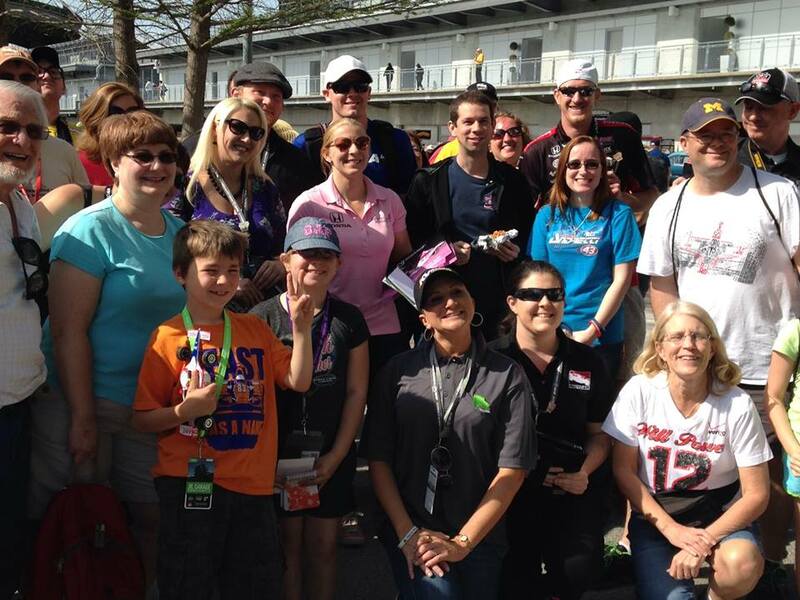 I know that Pippa made the day for each fan at the Indy Fans Tweetup. I enjoyed watching each fan’s facial expressions as they approached Pippa and connected with her in a personal way. It didn’t matter if the fan was a young kid or retired, she gave them her full attention. You can help Pippa and Susan G. Komen by donating money to fighting cancer here. I hope to see a lot of pink in the stands for this years Indy 500.